BDO Insights: How strong is the innovation power in your company? How can your start-up be innovative in proposition, processes or business? And how to use the inaction tax incentives? Many start-up companies set off with an innovative concept. But how do you move from a good idea to a proof of concept and even more demanding; from a proof of concept to a proof of business? Are you using all available innovation boosts? BDO can help to make this assessment and advise you on how to structure your innovation processes so you can enjoy all the possible benefits. To come up with an innovative idea you need to be creative, visionary and explorative. You need to think out of the box, have an open mind and look at the outside world seeing what opportunities you see and translate those into a new concept, product or service. As a start-up you probably recognize many of these skills in yourself. To translate the idea to a proof of concept requires many of the same skills. Like: Experimenting, finding ways to make your idea work and to make this idea robust enough to test it in reality. It is important to check from as many perspectives as relevant that your proof of concept survives the experiments and confrontations with reality. Probably you went to all that and you have a proof of concept. For (larger) companies that exist a long(er) time the shift to exploration is often a difficult one, as they were (or are) successful in exploitation. The next step is to develop from proof of concept to a proof of business. This requires a very different set of skills. This phase is completely different: other partners, other financing, other governance, another project leader and team members need to be replaced with people with the now required experience and skills. The concept needs to be marketed in this phase. You have to acquire leads and prospects, or a partner that does this for you. You need to get access to early adopters in the market. But probably you have not yet thought about the users (buyers) for your idea. And also important; how to find them? A better question to consider is how do they find you? This requires that your concept is visible on the right place and on the right way. And probably you need bigger investments and for that maybe a financial partner or a venture capitalist. Maybe you need investors to boost this development. Preferably one that brings you relevant commercial skills and access to the right network and prospects. A practical approach is to gather some interested (and interesting) companies around you to do the transition from proof of concept to proof of business together. This co-development has the advantages that your idea is working in or for several companies before you start you marketing. This marketing plan must be targeted at your early adopters to get access to the early majority. This phase requires skills in business development, investment, company development, marketing, networking, negotiation and convincing. A start-up, entrepreneur or management team will need help on these aspects as their mind-set is that of an innovative character. The control of the phase to proof of business is less explorative and more managerial and project driven. When you are in this situation you can contact us. Innovation is often seen as an R&D like process to develop new concepts, products or services. However, innovation can be seen in a wider perspective including business process innovation, leadership innovation (development), social innovation, commercial innovation, network innovation or financial/investment innovation. To be successful in whatever area of innovation a company needs a social setting in which people are safe to come up with ideas and experiment. For that it is important that ideas are considered carefully and not labelled as good or wrong. The person that comes with the idea has to feel free and the team that evaluates ideas has to be open minded. The process to innovate can be structured. This is the case for the process of generating ideas, so it results in more useable options. Also, the administration and development of idea’s can be structured. Just as a sales funnel, the ideas can be administered and enriched with criteria to prioritize and monitor them. Often there are more ideas and concepts than time and budget to develop them further. With a fixed set of relevant criteria, the most promising ideas can be selected. It may be that an idea is very interesting but that the circumstances are not ready to develop it. It would be a waist that the idea is forgotten when the circumstances are right for it. This is applicable for ideas for product development as well as for ideas in the other innovation areas. How to guide team thinking towards innovative options? In many companies that we work with we see, at a certain moment a need to either generate new business with new turnover or to be more successful with the current business. But how can you find innovations that fit your company and are likely to be successful in business? To enable that creative thinking process we use the model of the innovation egg. 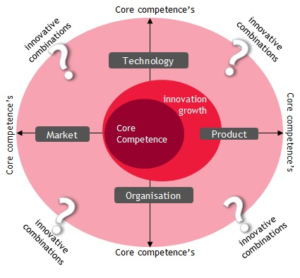 By using this model, we discover what core competences your company has on technology, product, market and organization. For many companies this is a difficult struggle because things they are used to and see as normal could be a differentiator for their customers of partners. After finding the core (or key) competences the next exercise is to combine them. In the combinations we try to think about what could be useful. There are no right or wrong combinations. It is more a matter of where is this combination useable and for whom. This will develop ideas and these ideas can be ranked on relevant parameters for the company. The ideas with the best score can be developed into concepts. 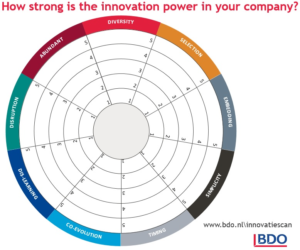 The BDO innovation scan: how strong is the innovation power in your company? An innovative company requires a setting in which people are enabled to be creative, open minded and safe to explore. When a ‘traditional company’ (organized to maximize exploitation) wants this innovative setting the transition can be facilitated with social innovation and organized with our evidence based change approach. To see how strong the innovation power in your company is we can use the innovation scan. This is based on the work of Charles Leadbeater, a contemporary thought leader on innovation, who made the analogy between evolution and innovation. In the evolution of species some became successful and other extinct. What can we learn from that? Which principles that lead to successful evolution can we use to make a company innovative? In cooperation (or co-development) with Professor Paul Iske we developed the innovation scan to monitors companies on innovation. Professor Iske has a chair at the Maastricht University on Open Innovation and Business Venturing and is founder of the Institute for Brilliant Failures; a knowledge partner of BDO. The innovation scan is based on the 9 evolution principles that seemed to be applicable to companies. Based on the scores by the team that undergoes the scan, we get a picture on the innovation wheel. This brings insights to the team on which dimensions they need to develop to be more successful in innovation. The innovation scan is tested and used in many companies. From this we detected 8 important lessons to consider when developing a company to be more innovative. These are published in the BDO magazine Anders (translation Different) of December 2016. Innovation requires effort and costs. The Dutch government motivates innovation by offering incentives to companies in the Netherlands that have innovative ambitions. Two tax incentives that reduce tax expenses are available for this purpose: the Research & Development Act (Dutch acronym: WBSO) and the innovation box. Businesses have much to gain from utilizing available tax incentives. Unfortunately, experience shows that many of them do not make use of all the options that are open to them. Does your company use the innovation tax incentives? Or don’t you know them? If you are unsure, you may want us to check whether you are utilizing every possible benefit (now that the rules and regulations have changed). BDO has specialists in tax incentives. They combine their knowledge with practical experience of your sector to provide tailor-made services. They can perform an initial scan, which is free of charge, to check what benefits are applicable for your company. We explain some high lights of the Dutch innovation tax incentives under this link page WBSO and innovation box and on a BDO webpage. You can invoke the WBSO during the research and development stage of your innovation. This entails a reduction in the payroll tax liability for wage and other costs as well as expenditures associated with the research and development work for your innovation. This reduction may run up to 40%. This can be used for the development of physical products, physical production processes or technically innovative software or software components or for technological and scientific research. The tax incentive under the WBSO can be invoked for all manner of developments and can take effect at any time during the research and development process. That said, the opting period is always one full calendar month and the application period spans at least three months within a calendar year. That is why the deadline for the last possible application in a year is 31 August. An application submitted on that date entitles the applicant to a tax incentive under the WBSO from October up to and including December. a registered utility model to protect an innovation (not being a design right). The innovation box can be applied to the years in which the conditions are being met. Contrary to the WBSO, the innovation box can be applied with retroactive effect to all years for which the corporate income tax assessment is not final yet. BDO will be happy to help you take steps to improve your innovative skills and company environment or to help you towards your proof of business. Our specialists can rely on their expertise and knowledge to advise in your specific situation. We have an open consultation period on Wednesdays, from 9:00 o’clock to 12:30 o’clock at Plus Ultra and from 13:00 o’clock to 17:00 o’clock at StartHub* in Wageningen. To make an explorative appointment to talk about your situation or ideas just send an e-mail to Oscar Sijtsma on oscar.sijtsma@BDO.nl. For tax incentives for innovation you can contact Niels Krouwel on niels.krouwel@BDO.nl. Register now for our Innovation Workshop: Creating added Value through Change on 12 June! This workshop is a joint initiative by BDO, RVO and EP&C. We look forward to meeting you and consider options and ideas.